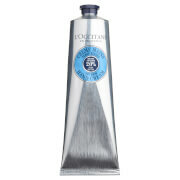 An instantly absorbed daily treat for delectably soft and luxuriously moisturized hands. White truffle extract for exquisitely soft hands. Enriching tamanu nut oil from Tahiti. Rub on hands when dry or after washing. Water (Aqua), Crambe Abyssinica Seed Oil, Isononyl Isononanoate, Glycerin, Butyrospermum Parkii (Shea) Butter, Coconut Alkanes, Propylheptyl Caprylate, Polymethylsilsesquioxane, Limnanthes Alba (Meadowfoam) Seed Oil, Ricinus Communis (Castor) Seed Oil, Cetearyl Alcohol, Sodium Acrylate/Sodium Acryloyldimethyl Taurate Copolymer, Fragrance (Parfum), Lilium Candidum Flower Extract, Tuber Aestivum Extract, Copernicia Cerifera (Carnauba) Wax, Hydrogenated Castor Oil, Amodimethicone, Coco-Caprylate/Caprate, Polysorbate 80, Isohexadecane, Cetearyl Olivate, Sorbitan Olivate, Sorbitan Oleate, Cetyl Palmitate, Sorbitan Palmitate, C12-14 Sec-Pareth-5, C12-14 Sec-Pareth-7, Stearic Acid, Palmitic Acid, Alpha-Isomethyl Ionone, Butylphenyl Methylpropional, Citronellol, Eugenol, Geraniol, Hexyl Cinnamal, Hydroxyisohexyl 3-Cyclohexene Carboxaldehyde, Linalool, Tocopherol, Butylene Glycol, Propylene Glycol, Phenoxyethanol, Iodopropynyl Butylcarbamate, Methylisothiazolinone, Citric Acid, Triethanolamine.